One of the best things about living in the Bay Area is the diversity of food. There are so many restaurants serving every type of cuisine you can imagine which makes living here so exciting. I heard about a new restaurant near the Castro District in San Francisco serving up Spanish tapas. Since Coqueta (read my review here) along the Embarcadero is the only Spanish tapas place I’ve tried in the city, I was curious to try Aatxe. Aatxe has a small menu with bite sized dishes, appetizers, and a few entrées. 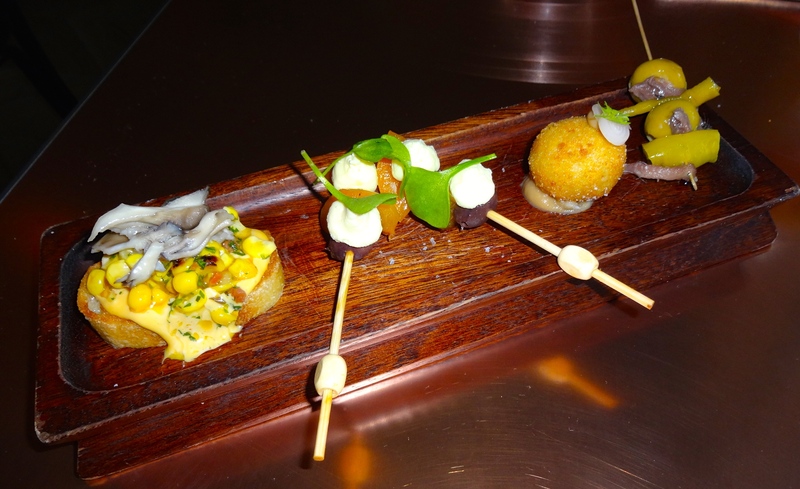 Pintxos: Corn Toast with Chorizo Aioli (8/10), Aprium and Black Olive (7/10), Mushroom Croquette (7/10), and Anchovy and Green Olive (7/10). Padron Peppers with Lemon Verbena Salt (8/10). 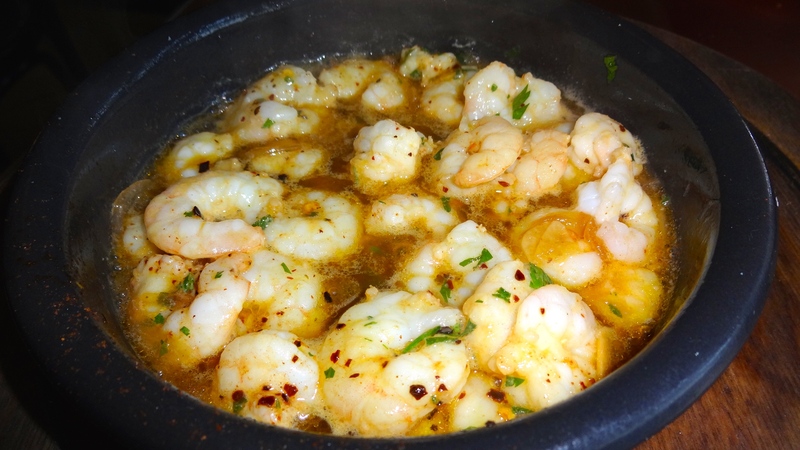 ￼￼￼￼￼￼￼￼￼￼￼￼￼￼￼￼￼￼￼￼￼￼￼￼￼￼￼￼￼￼Gambas al Ajiilo: Shrimp with Garlic and Chili (6.5/10). 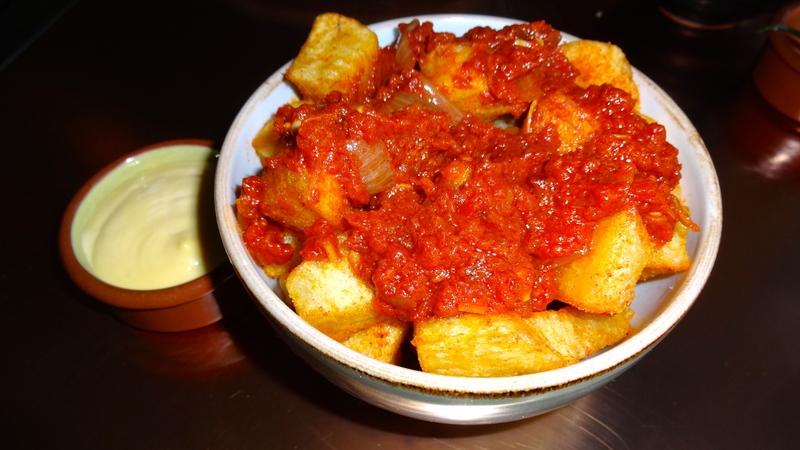 Patatas Bravas: ￼￼￼￼￼Tomato, Pimentón, and Aioli (7/10). 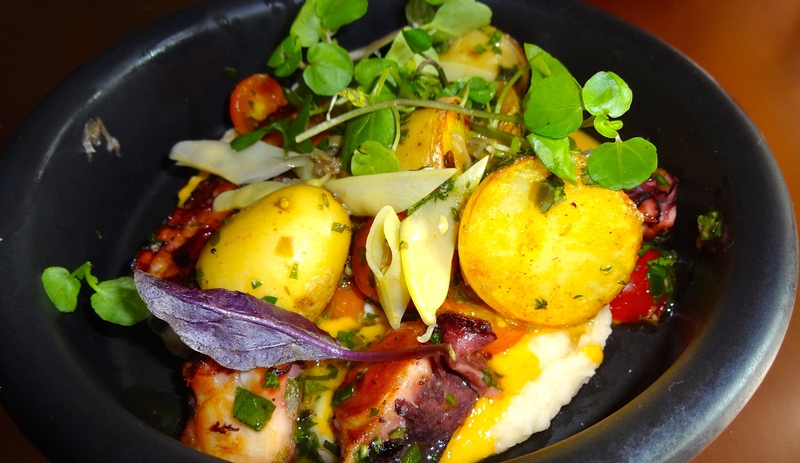 Charred Octopus, Fingerling Potatoes, Sungold Tomatoes, and Salsa Verde (8/10). 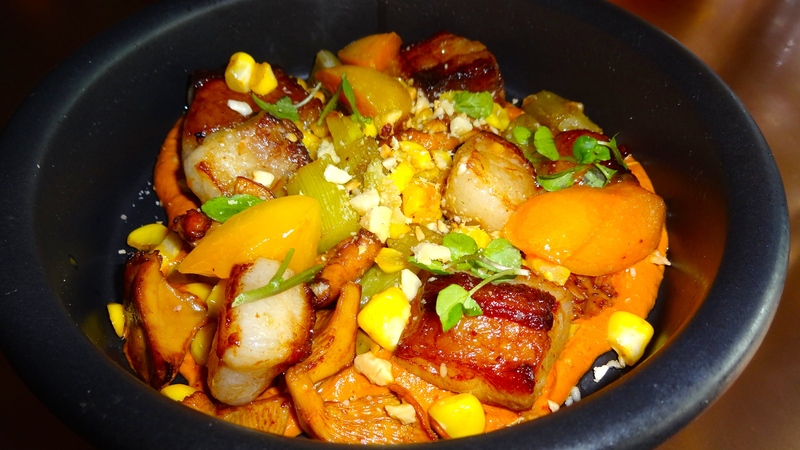 Pork Belly with Chanterelle Mushrooms, Corn, and Apricot-Hazelnut Romesco (7.5/10). 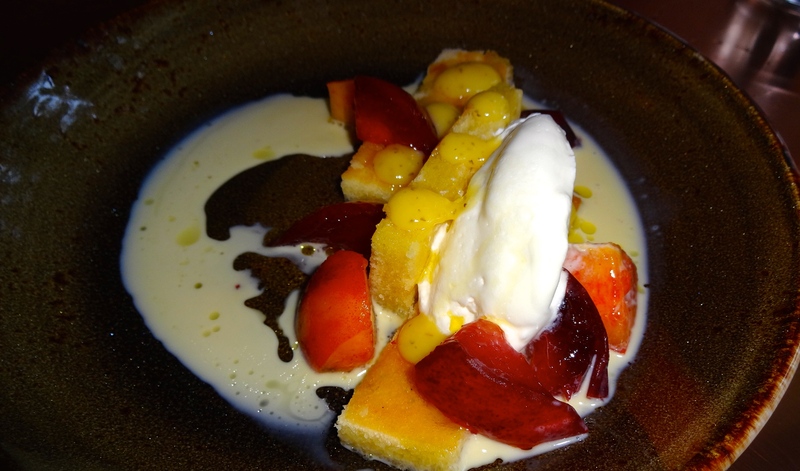 Olive Oil Cake with Stone Fruit and Lemon Verbena (7/10). 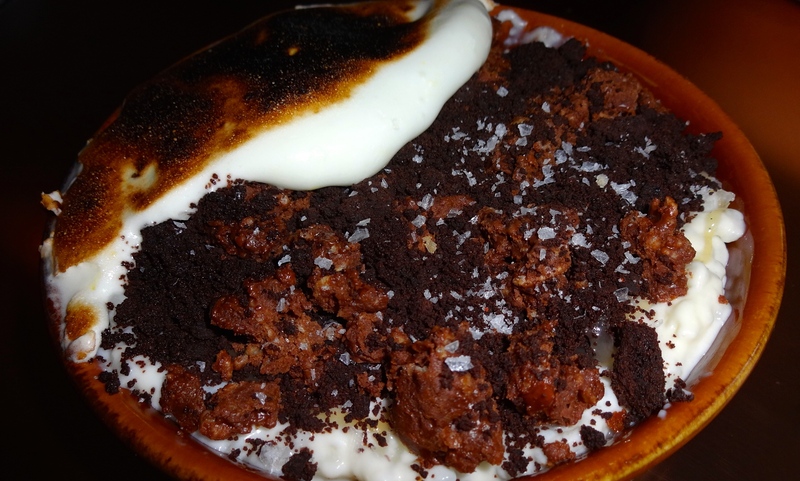 Cinnamon Vanilla Arroz con Leche with Dark Chocolate, Caramel, and Toasted Meringue (7/10). My favorite dishes of the night were the padron peppers, octopus, and pork belly. Starting off the meal we ordered a few pintxos, small bites/finger foods. My favorite out of the bunch was the mini toast smeared with chorizo aioli topped with fresh corn. 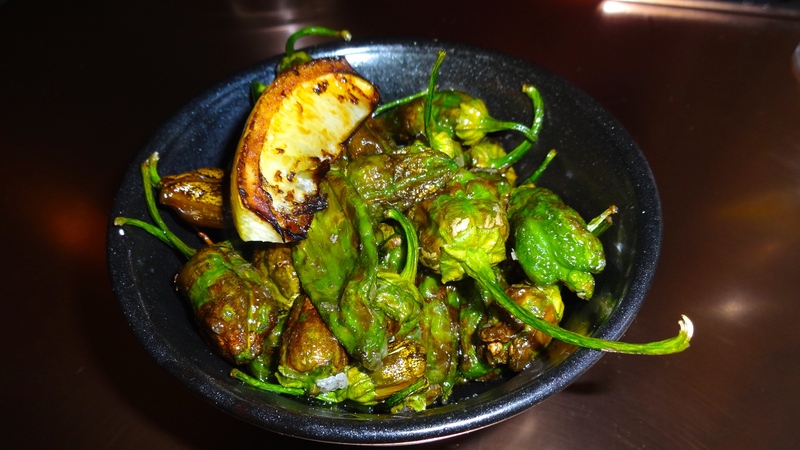 The padron peppers were a great appetizer; blistered and slightly charred tossed with lemon verbena salt. The octopus was perfectly cooked, tender with a slight char on the outside from the grill, served with meaty fingerling potatoes, sweet sungold tomatoes, and aromatic salsa verde. The slow cooked pork belly had amazing flavor and great accompaniments of earthy chanterelle mushrooms, corn, and a scrumptious apricot-hazelnut romesco sauce. Even though I enjoyed the meal as a whole, I think I prefer Coqueta over Aatxe for higher quality Spanish inspired tapas. Therefore I’d rate Aatxe at a 7/10.